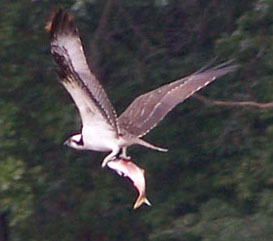 Alewives are an important food source for ospreys when sitting on eggs. The April 22 Fish Report shows that the alewife run in the Queach Brook and Branford River continues at a steady pace. It’s only about half way through the migration period and the fishway has already passed more fish than in either 2012 and 2013. If the strong flow of water over the dam is sustained, we can expect numbers more like the earlier years of the operation of the fishway.